Platform fights have always mattered. As he continues to campaign for Democratic primary votes from Indiana to Oregon, Bernie Sanders has begun to detail a vision for where the movement that has developed to support his candidacy might move the Democratic Party. After winning only the Rhode Island primary on a Tuesday that saw front-runner Hillary Clinton win Pennsylvania, Maryland, Delaware, and Connecticut—and, with those wins, a substantial boost in her delegate-race advantage—the Vermont senator released a primary-night statement that anticipated a way forward even if he does not win the party’s nomination at the Democratic National Convention in Philadelphia. Sanders has expanded on these themes on the campaign trail in recent days, in appearances in the key primary states of Indiana (which votes on May 3) and Oregon (which votes on May 17). On Wednesday, Sanders drew a cheering crowd of 2,200 people to a town-hall meeting on the campus of Purdue University, where he added new material to the stump speech he has delivered from the start of a presidential run that has challenged Clinton and the Democratic Party to move left on a host of issues. On Thursday in Eugene, Oregon, and again on Friday at the Indiana statehouse, where he rallied with steelworkers whose plants are threatened with closure as part of a corporate relocation to Mexico, Sanders made trade policy central to his demand for a new politics that champions working families over CEOs. “The Democratic Party, up to now, has not been clear about which side they are on, on the major issues facing this country. 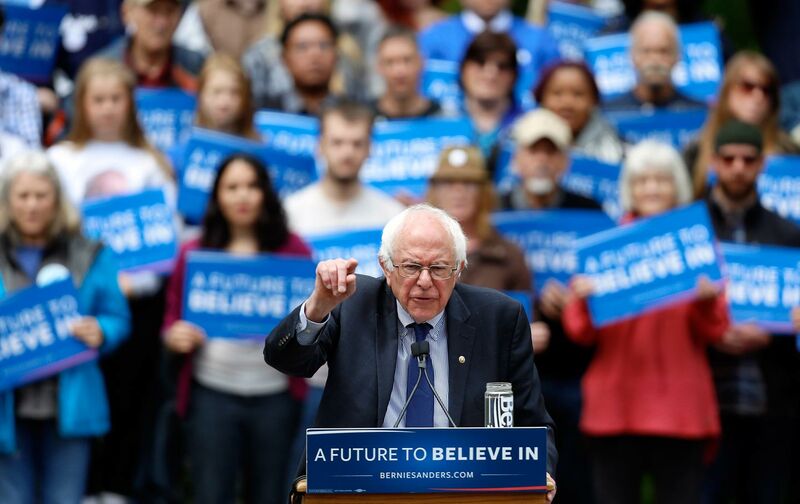 You cannot be on the side of those workers who have lost their jobs, because of disastrous trade agreements, and support those corporations who have thrown millions of our workers out on the street,” Sanders told the crowd of 8,000 in Oregon. Political and media elites, whose default position is to focus on the horse race (and the personalities associated with it), are quick to dismiss fights over agendas and platforms. With no sense of history, they imagine politics as little more than a progression from one dominant figure to the next. Movements, and the political trends and progressions that extend from movement-oriented campaigns, are invariably dismissed. But it was a movement, and a movement politics, that forced the Democratic Party to embrace a more muscular civil-rights platform than Harry Truman wanted in 1948; it was a movement, and movement politics, that began to open up the Democratic Party in ways that Lyndon Johnson had resisted in 1964. And it was the dismissal of movements, and movement politics, that proved to be disastrous for the Democratic Party in 1968. This is not 1968. The issues are different and the political processes are different. Conventions are more managed. And parties have come to see their quadrennial gatherings less as opportunities to frame their own future and that of the country and more as marketing moments. But 2016 is the most volatile political year since 1968. And the responses of the parties to it will define not just political organizations but the politics of this year and the years to come. But no one should buy into the fantasy that this discussion is inconsequential. Platform debates always matter. That’s why the candidates (front-runners and challengers) always take them seriously; that’s why key players in political parties (governor, mayors, legislators, union leaders) participate in them; that’s why interest groups try so hard to influence them. Platforms define parties, not just for the purposes of a campaign but for the future. It mattered when the Democratic Party embraced civil rights in a meaningful way in 1948, and in a more meaningful way in 1960 and 1964. It mattered in the 1980s when the Democratic Party moved (at the behest of the Rev. Jesse Jackson and his “Rainbow Coalition” campaigns) toward more aggressive opposition to South African apartheid, and when it moved (at the behest of the Jackson and Gary Hart campaigns of 1984) toward an embrace of the principle that the United States should work with allies rather than engage in unilateral military action. It mattered when the Democratic Party began to embrace LGBTQ rights in a meaningful way in its 1980 platform, and when it embraced marriage equality in 2012. For Sanders and his allies, along with progressives who have backed Clinton, the effort itself is consequential—not just in terms of framing the party’s immediate agenda but also in terms of framing the future of our politics. What was true three decades ago remains true now: Platform fights on issues of conscience and consequence, inspired by insurgent campaigns and insurgent movements, are always worth waging.